I’m not even close to being a super organized mother, as in, the kind of mother who maintains a color-coded family calendar, impeccably organized pantry, and foolproof system for managing the constant stream of children’s artwork coming home from school. But I do have my moments. One thing I can’t stand is a jumble of bed sheets, mixed up sizes (twin? full?) in unmatched sets. (A pillow case from 2008 with a brand new top sheet?! the horror!) When my children where younger, I solved this problem by buying printed sheets: sheets with trucks, robots, airplanes. I would buy whatever it took to get them to love their beds, with the added bonus of easily organized sets. Now that they are older, my sons are ready for unadorned sheets. Even my 7 year old requested plain white sheets after having slept on hand-me down robots, trucks, airplanes for his entire life. 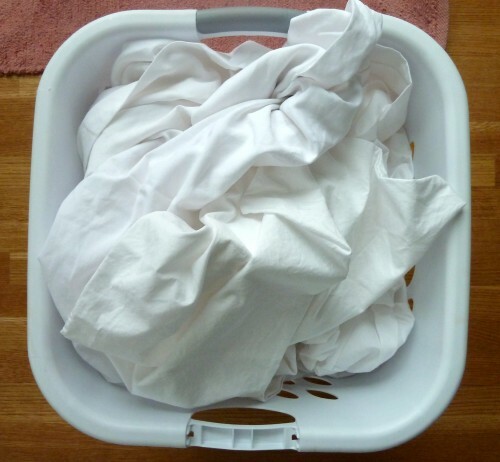 With a sigh of resignation, I imagined lots and lots of undistinguishable white sheets heaped in a laundry basket and waiting to be folded and organized into sets for each bed. Then, it dawned on me: this is a crafty opportunity! This is a chance to put my newfound craft of embroidery to practical use. 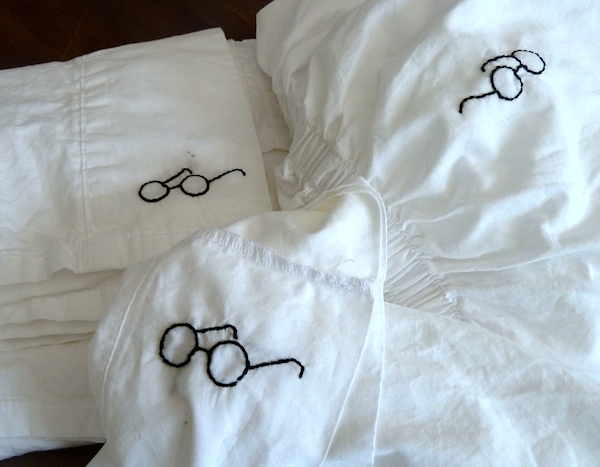 To distinguish among identical sets of sheets, I embroidered a symbol in the corner of each sheet/pillowcase, one symbol per set. Since this was more funcational than decorative, I stuck with a single color motif in a tucked away location – just inside the pillowcase, at the upper hemmed edge of the topsheet and at a single corner of the flat sheet. I started with a set of sheets for my 7 year old who is currently obsessed with Harry Potter. We dithered about how to reduce the whole Harry Potter saga to a single essential motif – a lightning bolt scar? wand? Hogwarts crest? In the end, we settled on the pair of spectacles you see here. Transferring the motif was as satisfying as ever and stitching was a breeze. (I used back stitch this time.) In the end, this was a speedy and satisfying project, though I’m not sure if it qualifies as a craft project, or merely clever housekeeping. P.S. I’m no Martha Stewart, but I do love this sheet organization idea from her website. Even more clever housekeeping! I love this idea! Even if I just embroider a teeny flower in the corner… at least they’ll all find their bed partners. Mismatched sheets are a horror, indeed! As usual, my darling… just delightful. Thanks, Britt. It is a satisfying and quick project! I love you! Why haven’t I thought of this before – I have just the same problem and it drives me nuts – I am off now to embroider the contents of the airing cupboard – thank you! Well, thanks Anny! Glad to know it was worth sharing. Good luck with embroidering. I’m sure you’ll come up with some beautiful and swirly designs! 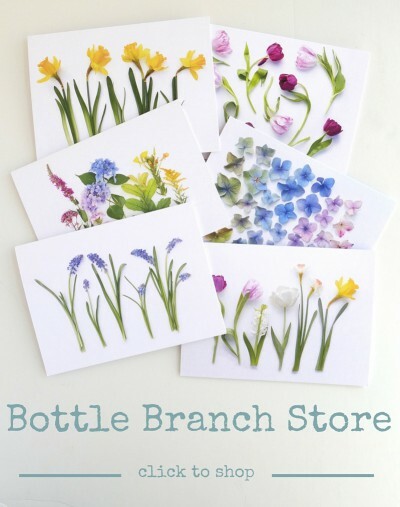 This is a wonderful idea – whimsical and practical. I found your blog on Knotted Cotton’s slow blogger linkup;). Thanks, Cynthia. NIce to meet you! I’ll pop over to knotted cotten and look for you there.